Before asking a question on FontCreator look here for possible solutions and tutorials. Please do not post support requests here. 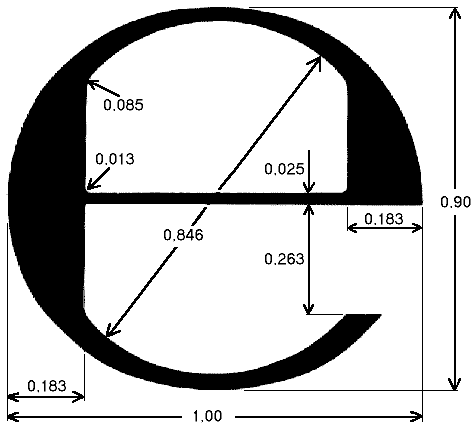 The Estimated symbol — ℮ — Unicode decimal codepoint 8494 is not a character, but a symbol. As I understand it, the design should be the same for all fonts. I came across this diagram on Michael Everson’s website, detailing the design and explaining about its use. If you don't wish to take the trouble of drawing it, you can copy it from my Verajja font (attached). 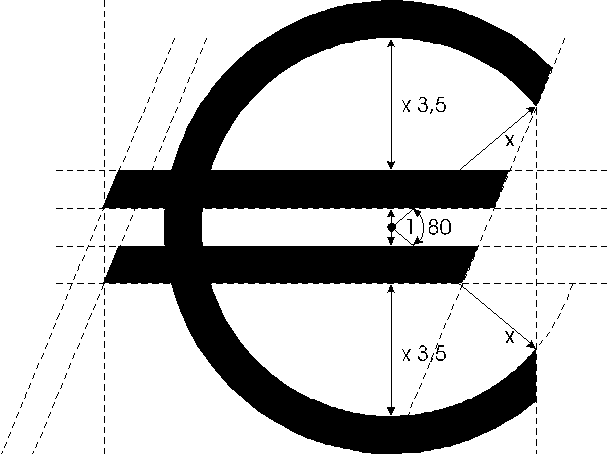 The Euro Symbol — € — Unicode decimal codepoint 8464 is a character, not a symbol, and should be designed to match the other currency symbols in the typeface. This is the recommended design. 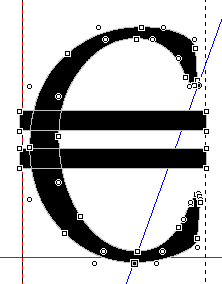 If your font lacks a Euro symbol, the Complete Composites feature can help you to make one. • Use insert Character and insert the Euro Symbol (8364) from the Unicode block, Currency Symbols. • Right-click on the empty glyph and select "Complete Composites" or click the toolbar icon. Decompose the composite to make the glyph simple. • Select the two nodes as shown in the image below and press "g" to create a diagonal guideline between the two. • Drag the nodes on the cross bars horizontally using shift to restrain vertical movement until they snap to the guideline. • Copy the guideline by holding down control and dragging it to the other end of the bar. • Drag the nodes to snap to the guidelines. • Switch to contour mode, select all three contours, and use "Get Union of Contours" to combine them into one. 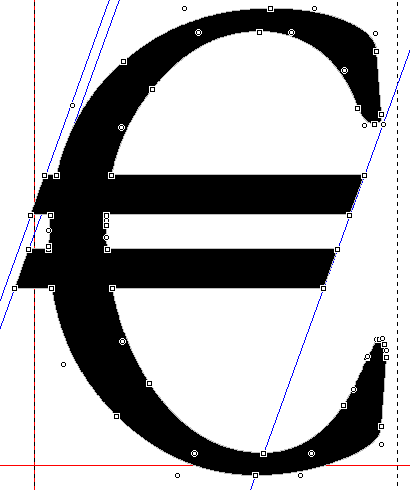 Complete Composites applies the width of the figure zero to the Euro symbol. If the design of the font permits, the Euro sign should be the same width as the numerals. You may need to scale down the capital C horizontally to achieve this. If you prefer, then just increase the advance width to suit the design of your font. Use the Comparison Toolbar to align the Euro symbol between two figure zeros. Last edited by Bhikkhu Pesala on Sun Sep 21, 2008 2:36 am, edited 2 times in total. All numbers are also supposed to have the same advance so they align properly in columns. I think this standard should apply to ALL currency symbols. Dave Crosby wrote: I think this standard should apply to ALL currency symbols. Maybe the dollar should only be about half as wide nowadays. I try to apply the same principle to many Maths symbols: + - = ± < > ÷ etc., but it isn't always suitable. Some fonts cannot be forced into this straight-jacket. Lining numerals are a relatively new thing. Fonts like Linotype Palatino have several sets of special numerals, Old Style (for use in text), Lining (even width), and non-lining numerals for general use. Take a good look at Palatino. You will find all sorts of special glyphs there, but unless you use an application that supports OpenType features, you may not be able to make use of them. Maybe the font should check the actual Dollar - Euro exchange rate, and based on that scale the dollar.